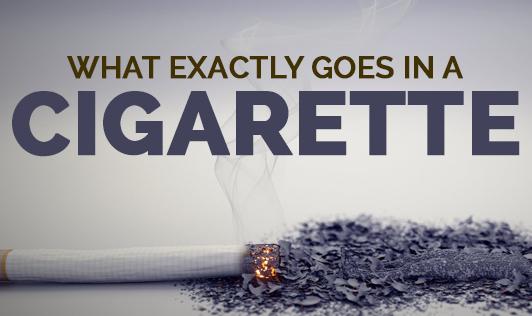 What Exactly Goes in a Cigarette? • Nicotine- Found in insecticides, nicotine is an addictive chemical found in cigarettes. • Acetone- Ingredient commonly found in nail polish remover. • Acetic acid- It's a common ingredient in hair dyes. • Ammonia- A commonly used compound in cleaning products and fertilizers. • Arsenic- An inorganic substance found in rat poison. Arsenic and tobacco are known carcinogens, reproductive and cardiovascular toxicants. • Benzene- commonly found in pesticide and gasoline, it is present in high levels in cigarette smoke. • Butane- A chemical present in lighter fluid. • Formaldehyde- Mostly used to preserve dead bodies; it is known to cause nose, throat and eye irritation and cancer in smokers. • Vinyl chloride- This man made chemical used in making plastics is present in cigarette filters. • Cadmium- A heavy toxic chemical used to recharge car batteries is present in twice the quantity in smokers as compared to non smokers. • Lead- 210 and Polonium-210- Lead- 210 and Polonium-210 are poisonous, radioactive heavy metals found in cigarette smoke. • Carbon monoxide- A lethal gas found in car exhaust fumes is present in high levels in cigarettes and is known to affect the flow of oxygen in the body. • Hydrogen cyanide- Is a deadly gas chamber poison. • Naphthalene- It's an ingredient found in moth balls. • Tar- It's a commonly used material for to pave roads. Having read through the big list of deadly chemicals above, do you still wish to continue smoking?